This novel by my fellow New Wold Newton Meteoritic Society member Matthew Baugh pits the Avenger against the German pulp hero Sun Koh, sometimes described as "the Nazi Doc Savage." There are several other crossover references. 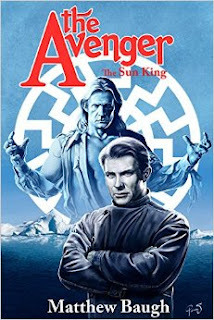 Since Sun Koh is an Atlantean prince, there are a number of references to other works involving Atlantis, such as Arthur Conan Doyle's The Maracot Deep and Robert E. Howard's Kull stories. Nellie Gray's father, an archaeologist, was friends with several of his peers, including Dr. Littlejohn of a university in Massachusetts (William Harper "Johnny" Littlejohn, one of Doc Savage's aides, whom Farmer identified with Professor William Dyer of Miskatonic University from Lovecraft's "At the Mountains of Madness"), Dr. Jones of a small but prestigious university in New Jersey (Indiana Jones), and Professor Smith of Cambridge, who smuggled dissidents out of Nazi Germany (Professor Horatio Smith from the movie Pimpernel Smith.) The other crossovers will be covered in my writeup in the books. I hope this gets through. I had a second post on Sunday's Crossover of the Week that seems to have been lost in the Web. I take it this has a whole lot of crossovers in it? If there is it makes the wait for the third volume of Crossovers (or would this be in the Fourth?) even harder. There are a lot of entries I want to read like The Scarlet Jaguar by Win Scott Eckert. I read the book and I think I caught all of the crossovers, but I want to be sure. It does have a lot of crossovers. It'll probably be in Volume 3, since it takes place in the late '30s. I will cover both this book and The Scarlet Jaguar quite thoroughly. Speaking of Atlantis, how does Namor's Atlantis fit into things, since Win included Namor as a CU character in the first volumes?